I’ve always been fascinated by communication. All kinds of communication. What I’ve learned is, it’s not always just about transferring information. It’s also about, well, engaging people, drawing ‘em in, so they stick around long enough to consider what you have to say. That’s especially true of marketing communications. And if you’re offering any type of product or service, then your website pretty much falls under that category. Having dabbled in both web writing and web design, I’ve learned that often it’s the words that end up convincing the buyer, but it’s the images their eyes locked onto first. One reason is that our minds process, or gain meaning from, pictures in a fraction of the time that it takes us to process words. Like website copy, website images should never be just an item to check off on our website to-do list. It takes a combination of extra sharp images and copy to pierce the higher strata of that buyer’s awareness, as she gazes at her laptop, in her kitchen, on a Sunday afternoon. Is she leaning in? Or is she leaning away? Remember that making a sale starts with making a connection. If our words and pictures both manage to connect, we’ll have invited both her right brain and left brain to the party. We’re reminded to optimize our images for the web, trading off photo quality for reduced download time. Important, yes, but no more important than optimizing images for those humans who happen to land on our site. The good stuff not only draws attention, which is good, but also shares, which is even better. Image sharing is such a thing today because overall we have a shared sense of what’s desirable, what’s to be avoided, what’s funny, and what’s shocking. A shared reaction to a shared photo is a very human, if distantly digital, form of touch. The planet-level impact of television in the late 1940s and early 1950s included well-groomed role models for modern families. The images people sat glued to helped forge a common national agreement on how to look, how to behave, and what to buy. The flickering images of TV families and the latest-thing products that regularly interrupted them arguably became the foundation of a new, homogenized social culture. Mere, two-dimensional, images. Good imagery has emotional, even visceral, power. From the first cave drawings, humans have always loved looking at pictures. Both still pictures and moving pictures appear to trigger tiny squirts of dopamine as our eyes dart around for even more pictures. We want to be entertained, we want to be informed, we want to be … captivated. Which is why websites stocked with average pictures (and copy) should remember that visitors have a Back button, and they know how to use it. So let’s see what we can do picture-wise to keep their curser away from that stupid left-facing arrow. You can improve virtually any photo by cropping it. Help the eye connect quicker with the main action by slicing off extraneous background around the edges. While there are of course exceptions, this can enhance the impact of everything from the biggest hero image to the smallest profile picture. With small web images especially, we want to avoid a lot of detail. Maybe a mortgage company’s website calls for a small ‘icon’ photo of a generic house. What if you zoomed in on that nice front door with its stained glass, as a simpler and more impactful symbol of home ownership? Experiment with different ways to crop a given web image, and remember that an unconventional approach may catch the eye quicker than, say, the formally centered portrait that people are used to seeing. The human eye is great at picking up anomalies, so it goes straight to the pimple in the VP’s headshot, or the skateboarder at the edge of an architectural photo. Eliminate those pesky distractions with an image editing tool like Photoshop, and keep people’s attention on what really matters. Although there are other photo apps out there, Photoshop offers the most flexibility for visually conjuring what the camera alone cannot capture. Brighten the main subject to draw the eye to it. Replace a boring background with a more compelling one. Maybe angle the photo’s contents for a more dynamic feel. Full color is the standard for photos online, which is why a web image with a color overlay (say, an overall bluish tint) tends to stand out. Black and white, used properly, can project a stark and sophisticated mood. You can also create a unique look by reducing the color ‘saturation,’ blowing out the highlight areas, or adding a little ‘grain’ to the image. There’s something to the criticism about stock photos being too generic or phony. But overall, the selection out there has improved over the years. The thing is, you’ll still have to spend time (maybe hours) trolling through those sites to find just the right shots with just the right look. Capture the thumbnails of all the ‘possible’ photos, then compare them side-by-side to make the perfect final selection. If you’ve engaged a photographer to shoot your web images, be sure they take lots of shots from different angles, because just like with stock photos, having more options gives you, well, more options. For portraits, we’re looking for a warm, confident smile and bright eyes, to make a genuine human connection with the viewer. A flat, neutral expression tends to come off as borderline hostile, and a big toothy smile just seems out of place. One of the essential purposes of compelling web images is to capture the eye and deliver it to a key selling message. For that to work best, the headline should be just below, or just to the right of, the main subject of the picture. Done well, this combination will snag the attention of even those just scanning the page. All this wouldn’t be so crucial if there wasn’t such an enormous universe of online imagery we have to compete with for our audience’s attention. 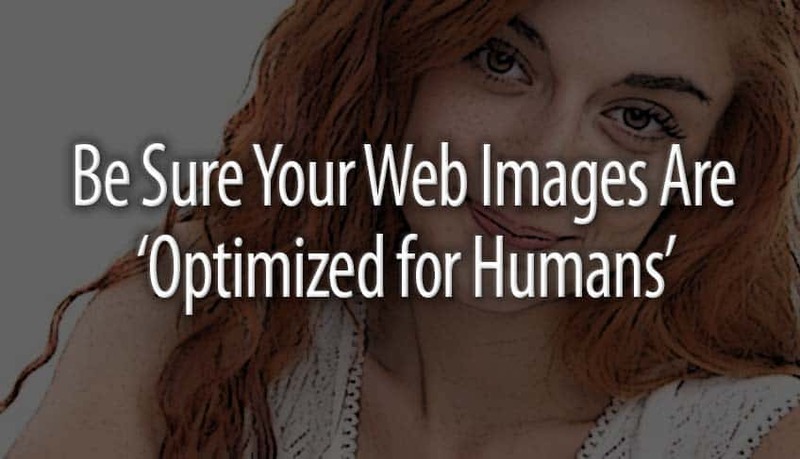 Know what’s important to the people you want to attract, and see if you can get your web images to appeal to them on both a professional and human level. The fact that there are so many so-so pictures on the web offers a chance to shine by working a little harder at it. The same applies to all the boring, unoriginal copy out there. Why pass up such rich and promising opportunities to stand out from competitors? For another take on the effective use of web images, check out the WebFX blog. To learn more about avoiding copyright issues with your web photos, visit this post by Search Engine Journal. And for examples of how web copy and images can work together, click over to some of my own work samples.